Student activists from hardline Islamic party Jamaat-i-Islami protest in 2009 against missile attacks in Pakistani tribal areas. Sen. John McCain says missiles fired from unmanned drones knock extremists "off balance"
Kabul, Afghanistan (CNN) -- Missiles shot from pilotless planes are an effective tool against suspected militants, two U.S. senators said Thursday. "The drone strikes are part of an overall set of tactics which make up the strategy for victory," said Arizona Republican John McCain. "They have been very effective, and they have knocked al Qaeda and other Islamic extremist organizations off balance." Sen. Joe Lieberman, an independent from Connecticut, said the drones were "a critical element of our effort, our campaign, our strategy to deny the terrorists who are terrorizing the people of Afghanistan and Pakistan a safe haven from which to strike them and us in the United States." The senators made their comments during a congressional visit that took them to Iraq and Afghanistan. Next on their itinerary is Pakistan. The United States employs unmanned Predator planes to gather information and launch strikes on suspected al Qaeda and Taliban operatives based in regions that hug the border of Afghanistan and Pakistan. Drone strikes killed at least 13 suspected militants in Pakistan on Wednesday in the fourth and fifth suspected drone strikes in less than a week. The attacks come after a suicide bomber killed seven CIA officers and contractors on December 30. Since President Obama took office last January, there have been reports of more than 40 attacks by Hellfire missiles fired from drones, an increase over the approximately 30 missile strikes launched in 2008 during the Bush administration. A U.S. official confirmed last month that the White House has authorized an expansion of the drone missile program. But the strikes are controversial because of unwanted civilian deaths. 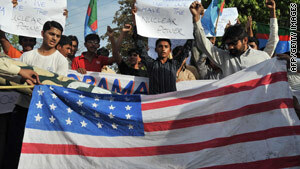 Pakistani authorities have said that the drone attacks help fuel anti-American sentiment in the region. McCain said the United States is hoping to mitigate the fallout. "We, working more closely with the Afghan government, as well as the Pakistani government, have made those operations more efficient and less damaging to the civilian population," he said at a news briefing at the U.S. Embassy in Kabul. McCain's comments came hours after al Qaeda claimed responsibility for last month's attack on the CIA officers and contractors, saying it was revenge for militants killed in drone strikes. Though drone attacks have been an important tool, they are not an overall strategy, McCain said. He cited the successes of the surge in Iraq and said a similar plan -- though under different circumstances -- is being implemented in Afghanistan. He said at least 400,000 trained Afghan troops will be needed to take over security responsibilities in their country. "So we will be seeking both the funding and the policy that would mean that the Afghan military can be built up to a total of 400,000 troops in order to fulfill the responsibilities and meet the challenges that they face," he said. "In Iraq, we failed several times to build a viable military," he said. "We finally succeeded with the surge strategy. The reason why the Iraqis are now able to control their own security is because of the size of their military and police." McCain added that he was concerned about Obama's announced 2011 date for U.S. troops to begin withdrawing. "That date, in my view, is artificial and should only be based by conditions on the ground," McCain said. McCain and Lieberman were part of a congressional delegation that met with Afghan President Hamid Karzai and several of his ministers Wednesday. Despite a recent torrent of criticism of Karzai's leadership, Lieberman said he was encouraged about Afghanistan's future. "We're not going to make the same mistake we made after the conflict with the Soviet Union," he said. "America is here to stay in the cause of a free and stable and prosperous Afghanistan."